Some parents and educators have the misconception that classical education is only for “smart kids.” It is not difficult to understand why someone might think this way. Latin at age 8? Herodotus by 14? With such standards, one might reason, surely classical education is only for born geniuses – the brightest and best of our children. Certainly for advanced performance at the highest levels of classical study, this theory has some merit. But what about those children who are not born geniuses? What about those who, far from being intellectually gifted, are living with cognitive challenges, language disorders, or physical disabilities? Does classical education have anything to offer them? Can classical education benefit any child? No doubt Helen Keller’s concerned parents asked the same question back in 1887. Their young daughter was deaf, blind, and severely “behaviorally disordered.” Distraught and fearful for the little girl’s future, as most parents would be, the Kellers hoped that Helen might somehow receive an education. In the late 1800’s, this meant a classical education. 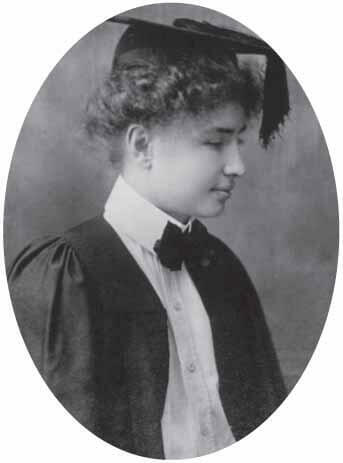 Helen Keller began her adapted classical education at the age of six with her private teacher Annie Sullivan. Although no one could predict the eventual outcome, the Keller family embarked on this ambitious, beautiful journey nonetheless. And the world received captivating evidence that classical education truly can benefit any child. From the ages of 11-13, Helen learned Latin from a Latin scholar and French in raised print. She studied more advanced histories of Greece, Rome, and the United States, as Annie continued to spell lessons into Helen’s hand. By age 16, Helen read works in the original Latin and German, and at age 20 she enrolled at Radcliffe where she read literature in French, studied World History, read poetry critically, and learned advanced English composition. Helen’s only real academic failure came when she was 17. One of her teachers made some common errors with this special-needs child, mistakes which continue to be made in many educational settings today. First, the teacher determined that Helen must devote herself only to those areas in which she was weakest, namely physics, algebra, and geometry. Moreover, he taught these subjects in a large classroom without necessary modifications. (For example, he wrote visual geometry proofs on the board with no means for Helen to follow along.) As a result, Helen required additional instruction with a tutor before she could enter Radcliffe as previously planned. If classical education could give Helen Keller the tools to overcome great obstacles and embrace the “sweeps of the heavens” so many years ago, why do even less-severely handicapped special-needs children fail to receive such a bountiful classical education today? Largely, the answer is simply historical timing. At the turn of the century, as special education grew in acceptance, classical education began to wane. In the 1930’s, “the height of classical study in the United States in sheer numbers,” nearly one million students studied Latin annually. By the 1970’s, so-called progressive and experimental education dominated. About this same time, just as classical education had all but disappeared, the landmark special education legislation Public Law 94-142 passed in the United States. This law mandated public education for all handicapped children. Public, yes, but often much less effective and far less beautiful. Today, much of “regular education” has strayed so far from the pursuit of that which is significantly true, good, and beautiful, many special-needs or struggling children who have been placed in remedial or even age-based classrooms receive little that is inspiring, excellent, or formative. In the past, even “basic” education meant purposeful instruction in the three arts of language: Grammar — including reading, Latin, spelling, penmanship, and composition; Logic – analysis, reasoning, and discernment; and Rhetoric – persuasive eloquence in both speaking and writing. A good liberal arts education also included the four arts of mathematics: Arithmetic (number), Geometry (number in space), Music (number in time), and Astronomy (number in space and time). These seven liberal arts developed the mind and provided the student with essential tools for learning. Intrinsic to his learning, the student also studied history, good literature, and art, all for the formation of a strong mind and noble character. Throughout the centuries, catechesis – teaching the faith – has also been urged alongside the liberal arts, for matters of the soul. Instead, today the ideal in special education is “individualized instruction, in which the child’s characteristics, rather than prescribed academic content, provide the basis for teaching techniques.” Worse, in some special education teacher-training programs, not only progressivism and pragmatism, but also fatalistic, dehumanizing behaviorism dominates. The child’s mind and soul are forgotten. The special-needs child’s humanity – any child’s humanity – must determine the education he receives. Some suggest that as many as 1 in 5 children have special educational needs. Each of these children is a human being, created in the image of God. Shall we assign all of these students to a menial, servile education and deny them the riches of a beautiful, humane, liberating education? And, worse, shall we base our deterministic placements on early testing, with no regard to what the child might be able to overcome with the aid of an excellent teacher? Regardless of his challenges, any child is called to do more than receive services; he is called to love and serve his neighbor. Even if he is never able to hold a full-time paying “job,” classical education can help the special-needs child bring purpose, love, or comfort to his parents. He is a student with lessons to learn, teachers to respect, and parents to honor. He is a young man who holds the door for aging members of his congregation. She is the person who thoughtfully replenishes a dog’s fresh water bowl while her neighbor is away at work. She is a sister, granddaughter, or niece, with the high calling of gracious and tender service, as God works through her for His loving purposes. We see uniquely converging opportunities at this time in history. Information abounds on special-needs and struggling learners. Classical education enjoys a re-emergence in numerous and growing pockets, for the youngest children through university levels. Abundant resources now offer instruction in Latin, the history of ancient civilizations, the mathematical arts, and more, at every level and with any amount of repetition and practice the child needs. Teachers, homeschooling parents, tutors — anyone who seeks to teach any child — can find helpful curricula for adapting reading, composition, Greek, music theory, literature, logic, and rhetoric. Perhaps the child will eventually prove incapable of progressing to advanced levels in one area or in every area; however, if taught slowly, patiently and systematically, even those children who are identified with or suspected of having “special learning needs” can receive a substantial, elevating, and beautiful education. Originally published in The Classical Teacher Winter 2012 edition.